15 Best Winter Activities to Do in Alabama! Alabama is characterized by a humid, subtropical climate, so its winters aren’t nearly as harsh as some other states in the U.S. In fact, the milder winters invite residents and visitors to partake in exciting outdoor activities more comfortably. From fishing expeditions to winter festivals and concerts, there is something for just about everyone to enjoy in the Heart of Dixie during the winter months, and here are the 15 best. Looking to escape to warmer weather? The Alabama coast has several deluxe golf courses that are near the beach. From Kiva Dunes Resort and Golf to Orange Beach Golf Center, golfers can enjoy the perfect weather for their favorite sport during these winter months. Missing the regular college football season already? Come to Tuscaloosa to learn the history of the boys in Crimson, as well as the rich football history the state of Alabama has to offer. The interesting artifacts and interesting exhibits will excite football fans of any age and will at least be able to hold you over until the national championship rolls around. During January and February, the Botanical Gardens in Huntsville invite you and your furry friends to enjoy the fresh air and sunshine of the cooler winter days. Bring your dogs and your kids to walk around in the gardens and beat the winter blues. Looking for a fun, educational activity to do with the kids? Visit the McWane Center during the winter months to enjoy ice fishing, holiday movies at the IMAX, and a special snow room where kids can make snow angels. The exhibit also features a chance to meet Santa, and an indoor snow hill. The McWane Winter Wonderland exhibit truly has everything you need for winter fun. There’s nothing like a visit with Santa to bring out the holiday spirit. Santa’s Village brings the Christmas feeling of the North Pole to the Southeast. Visitors have the chance to pet reindeer and even meet Santa himself. The village also features a Christmas Garden where trees come to life with song. Located atop Lookout Mountain near the Georgia border, Cloudmont has been home to fun winter activities since 1970. Whether you are a beginner or experienced skier, the resort has hills that are appropriate for any skill level. Cloudmont also features a year-round playground for younger kids to enjoy. Looking for something special for a friend or family member for Christmas? Come down to the Mobile Museum of Art’s Night Market, held monthly. The market features artists and craftsman who create locally-sourced, handmade goods. Support your local artists for a night of food, shopping, and music in a fun atmosphere. Winter is the perfect time to visit the Gulf State Park Pier. Enjoy perfect weather and good fishing in the scenic Gulf of Mexico. At 1,540 feet long, 20 feet wide, they are the second longest pier on the Gulf and Alabama’s only public pier. Experience Mardi Gras in the city that started it all. Enjoy the parades and fun festivities in downtown Mobile, full of beads, handcrafted floats, and other frivolities. While you’re in town, stop by the Mobile Carnival Museum to learn the rich history behind Mardi Gras and Mobile’s unique ties to the well-known celebration. It may be snowing in other parts of the country, but in Gulf Shores, the sunshine is out. Enjoy the many biking and hiking trails Gulf Shores has to offer near the beautiful seaside. Looking to support local businesses this holiday season? Stop in to the Holiday & Artisan Boutique Show in Birmingham to find the right gift for that special someone. The show features accessories, jewelry, candles, soaps, foods, gifts, skin care, health care, information booths, home decor and much more. Any history buff will enjoy the Christmas home tour in Decatur. Homes and other sites, adorned with traditional decorations, will be open for viewing as part of the self-guided tour. Enjoy scenic carriage rides through the town, along with several other winter fun activities. Join the University of South Alabama community for the Annual President's Holiday Concert at the USA Mitchell Center. With free admission for the public, the concert is the perfect way to engage and support the local student body. USA's Department of Music students and faculty will be the featured in a concert highlighted by classical and popular holiday pieces. The concert is a fun event for the whole family. Visit the Thornhill Farm in Pisgah, Alabama, for a family-oriented day of Christmas fun. Kids can enjoy a ride on the “Miss Joy,” a custom-built train that rides through the beautiful forest. Santa is also available for visits, and his head elf can give you a tour of his toy shop. Get into the holiday spirit with the West Alabama Christmas Parade. The annual celebration features creative Christmas-themed floats and a visit from Santa himself. 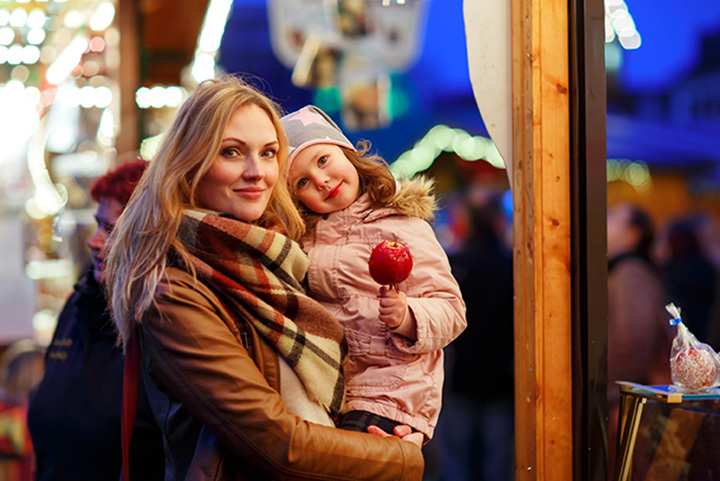 Bring the whole family to enjoy holiday fun with good people.